Dan Carr took the reins of General Cigar Co. last year just as it celebrated its 50th anniversary of making cigars by hand. As president at 48, he now heads one of the cigar world’s biggest companies—the maker of Macanudo, Punch, La Gloria Cubana and Partagas. 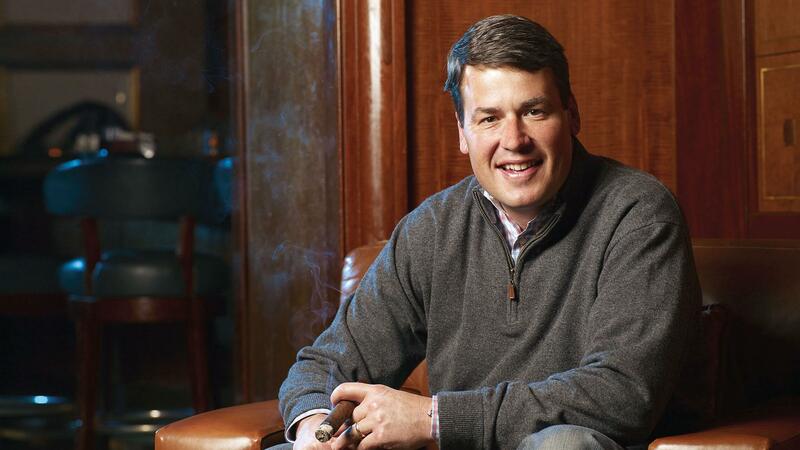 Carr had joined General in 1996, quickly rising to vice president of sales, at the height of the cigar boom. When Swedish Match AB bought the company’s mass market business in 1999, he went to work on the Stockholm firm’s White Owl machine-made cigars, Red Man chewing tobacco and other products. In 2005, Swedish Match acquired General Cigar and returned Carr to that division as its senior vice president of sales and marketing in 2007. Promotions to chief operating officer, in 2009, and then president, in 2010, followed in rapid succession. When Swedish merged last year with the European giant Scandinavian Tobacco Group, Carr was charged with integrating the U.S. operations of both companies, which also added the C.A.O. brand to his portfolio. Today, Carr is responsible for leading the new company’s premium cigar business on a global level. Recently, Carr sat down in New York City at his company’s Club Macanudo cigar bar for a lengthy discussion with senior editor David Savona. Savona: Let’s get to know you a little bit. In 1996 you started with General. Was that your first time in the cigar business? Carr: Well, yes and no. When I first came out of college in 1983, I went to work with a buddy of mine whose dad had a construction company. It was in Saddle River, New Jersey. We ended up building a warehouse. And the warehouse turned out to be Villazon [then the owner of the Punch and Hoyo de Monterrey cigar brands]. It was my first construction job. The most they let me do was mix the cement. And in 1997 we [General Cigar Co.] ended up buying the company. Q: What a small world. Does that warehouse still stand today? Q: You did a good job. In 1996 it was the height of the cigar boom. What was it like? A: It was easy to get an order. It was fast-paced. It was a lot of learning for me. It was really my introduction to premium, luxury goods. We had a lot of growth in that period. The reason I went to General is I sat with the president at the time and I asked him, “What are your objectives?” And he said, “If I don’t double the company in three years I failed, if I don’t go international I failed, if I don’t double the employees I failed, and if I don’t take the company public I failed.” I left the building and I called my wife and said either I’m doing the smartest thing in my life or I’m doing the dumbest. It’s been incredible. It’s an extremely challenging business, it’s not a traditional consumer packaged products environment, we have to face legislative and regulatory issues, and we have to work on ways to build awareness in a very niche business. Q: You studied business [at Harvard Business School]. When you heard this description from the president of General, what did you think? A: It was exciting. I loved the ambition. There was a vision of where this business could go. Q: What was your role in ’96? A: I actually came in as VP of sales. I got the opportunity to work for Edgar [Cullman], both Sr. and Jr., and did that all the way up to ’99 when we got acquired by Swedish Match. Q: Were you machine-made and handmade back then? Because General had both segments in those days. A: My role was both. Q: What are some of the differences between mass-market and handmade? A: Units for one—I believe the machine-made is roughly seven billion cigars in the U.S. while handmade cigars are estimated at 241 million. Mass market is more about efficiencies. The mass-market side is very data driven. It’s fact-based. You’ve got the human factor on the premium side, and on the premium side, we don’t have the data. And a lot of times the [individual store] owner is the buyer on the premium side, which you don’t see on the mass side. The other thing is the personalities and the characters. Both have pluses and minuses, but the premium cigar business is a passion. We’re working all the time because we love it. We hope we’re making an impact. Q: How many employees does General Cigar have at this time? Q: Are most in the Dominican Republic? A: Yes. Obviously most are in the factories. Q: I know you’re big—how big is General Cigar in the handmade world? Q: How many cigars do you make? A: You know we don’t share those things. Q: OK, then who is bigger than you? In the world of handmade, who is bigger than you? A: Nobody. We’re the largest. With the recent joint venture we strengthened our No. 1 position in the U.S. market. We’re very small outside the U.S., we see that as an opportunity. We think we have roughly around a 35 share of the market. Q: So the Scandinavian Tobacco Group, in the U.S., is No. 1? A: We were pre, and we are post. Q: What are some of the advantages that you enjoy because of your size? A: With size comes resources. With resources comes people. We have the best of both worlds. If you want to buy leaf or grow leaf, if you want to test things, if we want to age tobaccos in a different way, create blends, the different factories that we have—it becomes endless, what you can do. It gives us a lot of dexterity toward creating brand boutiques. If you think about ideation, if you think about technologies, research, planning, if you’re one brand, and you have one person in charge, it’s extremely difficult to meet the demands of the anticipated opportunities, as well as the challenges, that exist in the market. Another example if you take a look at our legislative affairs we’ve got a dedicated team at both the state and federal level. We have a whole in-house legal team, and we’re the only premium cigar company that does. We do that to fight for the rights of the cigar industry. I sit on all the boards. And we have a larger lobbying team, both at the federal and state level, than anybody else. We see that as our role. It protects the industry. Again, if you’re one person, one brand, there’s only so much time in the day. I’m fortunate that I have a talented group of folks within General Cigar that can weave all these different pieces. So we think we can lead, having these resources we think enables us to take the position to work to expand the category, bring more consumers in. Q: How is the market? A: We did come off a mini boom from ’04 to ’06. Our best estimation of what we think the market size is, at that time it was around 314 million cigars. In 2010, we see the market around 241, and imports are 259. With inventories, the number feels about right. If you look going forward, a lot of the challenges are behind us. One never knows, given the business we’re in, but we’re very optimistic about the future. We think the economic environment will continue to improve. And hopefully some of the bans will start to stabilize. I think what’s amazing about this industry is the resiliency of the industry. The creativity. How do we get to enjoy cigars? The consumer is extremely resilient. This is a passion for him, it’s a lifestyle, and they’re very creative in the way they enjoy a cigar. I think that will continue. The idea is to get people to understand the lifestyle. I’d say more things have changed in the last three years than in the last 12 before it. We have kind of a trifecta there, if you look at the economy, social trends and the legislative environment. If you put them all together, those three things hurt the most in the cigar industry. This industry is about celebration. It’s about taking an hour and sitting with good friends. When those three things happened, it was a major impact. If you look at the political landscape right now, there are 39 states that have a partial or full smoking ban. Q: In terms of impact on a cigar company, what’s worse? Is a smoking ban worse than a dramatic tax increase? A: Yes. I will tell you, bar none, bans are the worst for the industry, because you’re taking away the occasion. It gets to a tipping point. Taxes, the economy, people can adjust. Bans are tough. Q: How have people’s buying habits changed? A: We’ve seen the consumer trade down, we’ve seen them buy less cigars per occasion. But again, we’ve seen that changing. Q: How are General’s sales doing? Q: If the category was down 11 percent, and you’re growing share, then you weren’t down 11 percent. But did you grow last year? Q: But that’s not the same as growing. So you’re doing better than the category? Q: Let’s talk about specific brands. You have quite a lot. A: I would say we have 60. It depends on who you talk to—there’s been quotes of about 1,500 brands on the marketplace—how do you define a brand. We would say Macanudo the brand, is the parent, and then you have the children. Q: So counting Macanudo, Macanudo 1968, Macanudo Crü Royale as one brand, you have 60 brands? A: Yes, and we have a lot of smaller ones. We have seven core brands—Macanudo, Punch, Partagas, La Gloria Cubana, Cohiba, Hoyo de Monterrey, C.A.O. In the marketing mix, that’s where we spend most of our time. Q: Could you rank these brands in terms of sales? I know you don’t like giving numbers, but obviously Macanudo is your biggest brand. What’s your second biggest—Punch? Q: Can I get number three out of you? A: Let’s stick with those two. C.A.O. is a very big brand. Partagas, La Gloria, and then you’re onto Hoyo. Then Cohiba obviously. They’re all big in their own right. Q: You also have a lot of factories. [See sidebar at end for factory list] Does every factory have its own personality to it? A: Very much. They’ve all come into the organization differently. And we have different management. Jhonys Diaz oversees all the different factories, but he has different General managers that run the factories in their own way. What you see the same is, the pride level is very, very high, the commitment to quality is very, very high. When you were in Santiago you saw great energy on both sides, but different energy. You can see the teams, they’re wearing their own uniforms. Everybody has their own personality but they know they’re all part of one company. Q: What kind of changes have happened since the merger between Swedish Match and Scandinavian Tobacco? A: I think when you get to the merger side of it, obviously for us we see enormous opportunity to make an even stronger premium cigar company. This is a very exciting time for us. The merger enables us to be a little more flexible when it comes to our goals, and what we want to achieve. It also enables us to get even more support, and that’s both domestically and internationally. The other big thing is, when you look at it, it complements the portfolio. C.A.O. is a wonderful complement to the portfolio, and it’s cared for by the largest and most innovative sales group out there. For us, it’s exciting. The joint venture as a whole was really more focused on outside the U.S. than inside the U.S., but if you look, inside the U.S. is complemented in many ways. C.A.O. is a different brand profile, and it enables us to build on it. Q: What has changed since the merger with C.A.O.? A: For the consumer, nothing. Same cigars, same packaging, same everything. The nice thing about it is both companies have been involved in the cigar industry, so it’s not like what took place was new. We shared a lot. We gained a lot of very good insight. Our approach is to really learn everything and realize we understand the brand as best that we can. You got to smoke them, taste the tobaccos, understand how they relate to one another. Obviously on the manufacturing process we’re learning there as well. A: In Santiago. Since the merger we’ve defined the overall organization, we basically centralized the corporate headquarters, as well as all the distribution, we integrated the C.A.O. portfolio, we established all the terms and sales for the combined entity. The nice thing about it is we stuck to our core values and are trying to give it as much respect as we can and did it as fast as we possibly could to have minimal disruption. Q: The STG factory in Estelí is the first Nicaraguan factory for General Cigar. Any plans to make any other cigars there besides C.A.O.? together. And you combine that with our relationship with the Plasencia Family. Q: Talk about the venture with Plasencia—what does that bring to the table? A: We’ve had a very long relationship with the Plasencia family. We’ve procured leaf from them for many years. This helps secure that for the future. And it gives us the opportunity to work together. It’ll happen over time. Q: Describe what the joint venture does. A: For the Plasencias nothing changes. It’s a minority stake, we have 20 percent of the company. [Note: The deal was announced in March 2010, and closed later that year.] It lets us work together even closer. We do a lot of cultivating seeds, we get to share more with each other. It’s all about collaboration. Q: But you buy from other brokers as well? Q: It must be sobering. A: For us it’s not just the number. Because of our size, we’re the first ones. We go in there, we look at the tobaccos, we taste the tobaccos, we select the tobaccos we pick the tobaccos. We’re not just going in there buying a couple of bales. There’s times we’ll buy crops, there’s times when we buy things to experiment. We have flexibility. Q: And you have deep pockets. A: Which helps us do that. The benefit to the consumer is we’re bringing different things to the market. And again, if I’m one person, one brand, I can’t go and travel around and look at things and try things—I have to make sure my business is running. We have some differences. Q: You grow tobacco in Connecticut. A: A.J. Thrall [a family of tobacco growers in Connecticut] does most of Connecticut. Q: You own fields there? A: We own fields, but we haven’t grown in Connecticut in a number of years. Q: So General still owns fields, but the tobacco is grown by the Thrall family. A: Yes. Our relationship with them goes way back. Q: I’ve seen some of your warehouses. You have tremendous amounts of tobacco. Are there other varieties you haven’t used, stuff we haven’t seen before? A: Absolutely. That’s the fun part of the business. That’s the library. A: We have a library of different tobaccos that come from different regions, different areas. We can select from different parts of the library at different times to create different tastes, different blends. For a blender, they’re like kids in a candy store. Q: So what’s your favorite cigar? A: I get to smoke just about everything. I love anything with Ometepe in it. [General uses some tobacco from the Nicaraguan island of Ometepe in many of its brands, including Punch Upper Cut and Macanudo 1968.] I’m a big Macanudo 1968 fan. It depends on the day. It kind of makes the job fun. This is a funny industry. You do it all the time. It bleeds over into your personal life. Q: Can you take me through the process of making a new cigar at General Cigar? How does it go from someone’s mind to the consumer’s hand? A: I’ll give you the short version. We have a whole innovation team. They meet quarterly. You’ll have people from sales, marketing, leaf people, you’ll have consumers, and we’ll come up with ideas and concepts. And we’ll put them out to consumers and test them. We’ve created over the last three years a whole consumer tasting group, which is in the thousands. This is another way for us to not only work internally with people who have been with us 45 years or more, but we also utilize consumers who are extremely passionate. We’ll give them the same samples that we smoke. We might ask them how much would you pay for this? And we might go through 200 blends. It’s a long process for us. We’re only going to market with things that have been tested. Q: Do all of your cigars go through such a lengthy process? A: Yes. What we don’t want to do is take up valuable shelf space of a customer with stuff that isn’t going to work. We want to make sure we do our pre-work ahead of time. Q: What do people want in a cigar today? A: We think three things. The first one really is the consumer saying I want a well-balanced, flavorful, extremely well-constructed, high-quality cigar at a great price. The second thing we’re seeing is, the consumer today is looking for something new. With Mac Vintage, we put broadleaf on it, we put a metal ring on the cigar. We’ve been back-ordered on it. Hoyo Reposado is another way we’ve looked at the aging process, introducing cedar and doing a whole new experience for consumers. If you look at La Gloria Cubana, what’s going on with the Serie N line, there’s packaging and construction innovation. You take a look at those types of things and you start to try to match it to an occasion. Q: In 1996, every new cigar seemed to be $10. The bargains were the old established brands. Today you’re seeing lots of very interesting, superb cigars at a good price point. That’s good for consumers, but not necessarily good for companies. A: It’s harder, because tobacco prices continue to go up. Given the inventory of tobaccos, the library of tobaccos, that we have enables us to make wonderful cigars at great price points, and we’re going to match up to where the market is. And we’re going to make sure where we see opportunities. We’re not filling the market with something we already have. We’re coming out with something that doesn’t exist. Q: Where do you find these niches? Cigar shops are crowded. Is it tough to get new cigars into cigar shops now? A: Yes, at the last IPCPR [International Premium Cigar and Pipe Retailers trade show], if you took extensions and brands, there were a couple of hundred new items. And the average tobacconist carries 600 to 800 boxes. That’s one-third new. What we’ve been trying to do is be very targeted and come in with things that have been tested. We’re trying to come in with things that fit the consumer need or void. Q: Is your portfolio somewhat fluid then? You’re putting new things in. Do you have to take things out every year? A: We look both ways. If something isn’t relevant it doesn’t make sense to tie up capital and resources on it. Q: Have you taken things out recently? A: Yeah. We do it relatively quietly. We will always have the products available to the customer who wants it. Q: You mean via a catalog? A: No, we’ll ship it to retail. If a retailer has a consumer and that’s what they buy, we want to make sure we honor that. But we can. Q: So what am I missing in the General Cigar story? A: The one thing that I learned, business-wise, is you can have wonderful assets, but at the end of the day it’s all about the people. Through different things that the Cullmans have built, the legacy that they’ve brought to General Cigar over the 50 years, you complement that with the different acquisitions that we had, El Credito, the UST acquisition, which brought in Don Tomás and Helix, you take it into C.A.O. as well as Plasencia. We really have amassed some of the most talented and most experienced people in the cigar business, which makes my job extremely easy. If you look ahead and you say most of the challenges are behind us, but again we’re in a challenging industry. This is where I’d want to place my bet. I’m very optimistic about the future. We can lead upon tobacco, cigar-making, cigar master, technology and research, even on how we plan the business. We want to make sure that we’re helping our customers grow, and that we’re introducing as many consumers as we can into the industry. Our portfolio competes on every price point, every flavor and every taste. And we think we can do even more with the brands.